The Farmers Market draws crowds to mingle and shop every Saturday morning, and this Sunday night (11/2) there’s a chance for us to support the Market. 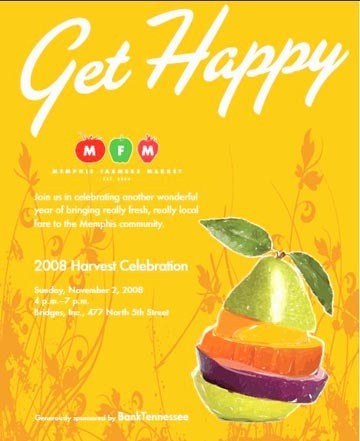 The 2008 Harvest Celebration, with its auction, tastings, and live music, will be held at Bridges Inc. (477 N. Fifth Str.) from 4-7 pm. Tickets are $40 per person, $75 per couple, or $25 for vendors, market volunteers, and MFM friends. For more information and to buy tickets online, click here. 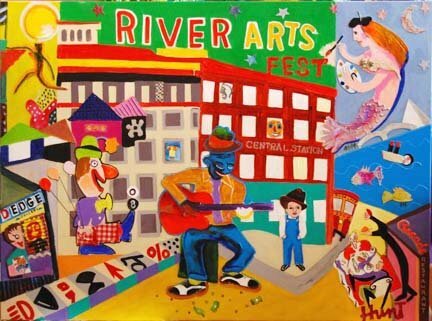 RiverArts Fest takes to the street this weekend and melds the senses to let us see, hear, feel, and taste art in all its forms. The festival on South Main in the historic art district is free and open to the public. 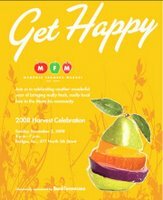 Hours are Nov. 1 (Sat) 10 am to 6 pm and Nov. 2 (Sun.) 10 am to 5 pm. For more information, click here.